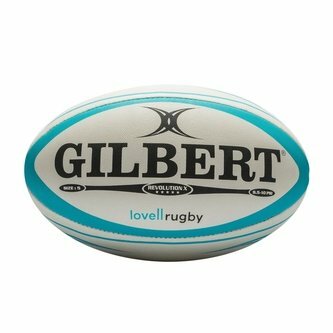 Ready for action in competitive games of a higher skill level, grab this Gilbert Revolution X Limited Edition Rugby Match Ball in White and Cyan. This limited edition rugby ball from Gilbert, producers of the best balls in the business, features our seal of approval with the Lovell Rugby logo printed on it. This ball is designed for matches in all conditions and is well suited for both amateur and professional level games. This high quality ball features reliable grip and is pre-kicked at manufacture to ensure it's up to scratch. Available only in a limited quantity, make sure not to miss out on getting your hands on this Gilbert Revolution X Limited Edition Rugby Match Ball.